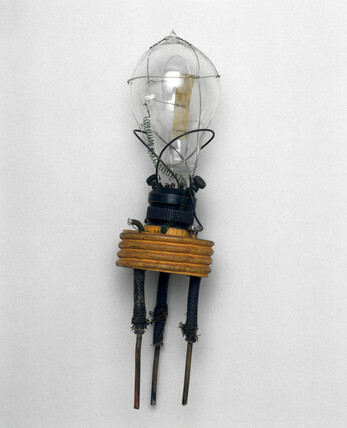 Replica of the original oscillation valve made by John Ambrose Fleming (1849-1945), an English physicist and electrical engineer. As well as being a pioneer in the application of electricity to lighting and heating on a large scale, Fleming invented the thermionic diode or valve. His invention was a major step forward in wireles technology as it was considerably more efficient as a radio wave detector than coherers or magnetic detectors. Valves became fundamental components in radios, as well as television sets and computers for 50 years, before being superseded by the transistor.